You've just found an easy way to create flowchart for Excel, and here is the tutorial. Our program help you make a flowchart instantly and export to Excel file with one click. It runs on all major platforms: Windows, Linux, and Mac OS X. 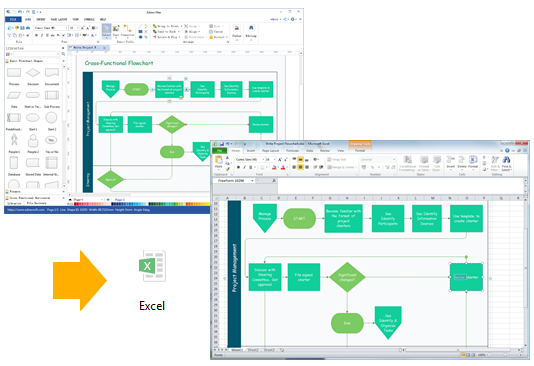 Drawing a flowchart and displaying in Excel is super easy using Edraw. It has a special flowchart toolkit including professional tools, symbols and templates tailored for flowcharts. What you need to do is to add symbols from the pre-defined library, and automatically add more shapes by clicking on floating buttons. When it's done, one more click on the Export button, you can convert the file to Excel XLSX format, with everything showing perfectly. Edraw is working well not only on Mac OS, but also on PC and Linux. Flowchart is a visual documentation showing how steps in a progress fit together. Each step in the process is represented by a certain symbol and the symbols are linked together with arrows showing the process flow direction. Flowchart is helpful in understanding, defining and analyzing a process. With an extensive collection of accurate, ready-to-use flowchart symbols and templates, you are able to make presentation-quality flowcharts effortlessly, with no prior experience needed. View a more detailed guide on how to draw flowchart. From the start page, find Flowchart template, and double click to start. The flowchart symbols library will open automatically on the left, which contains the most commonly used shapes for flowchart. Drag useful shapes and drop onto the canvas. Add more steps by clicking on the floating buttons of the shape. Choose more shape styles from the floating button on the top right corner of the shape. Double click a shape to add text. To add text outside a shape, click Text button on Home menu. Rotate, recolor or resize shapes according to your purposes. Apply a theme to change the whole diagram's color, font and effect. Export the flowchart through the Export and Send button on File menu. Exporting to Excel is just one button click away. The exported flowchart in Excel could still be edited. 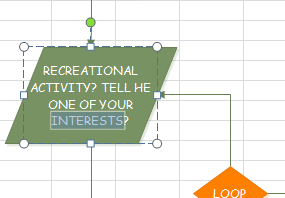 With one more step, the flowchart is converted to Excel seamlessly. As the picture shows below, it still remains high quality. Simply go to File tab, click Export button and choose Excel to save your file as XLSX format. 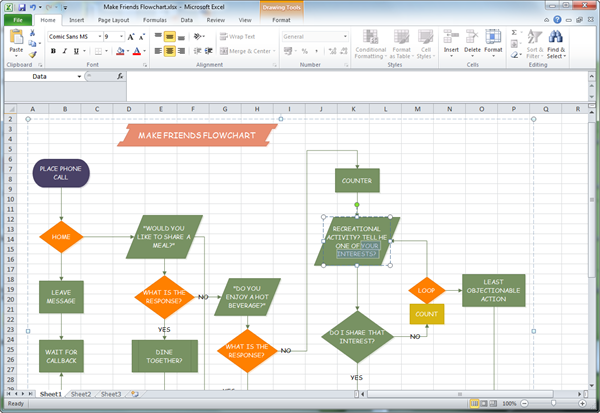 The exported flowchart will remain the vector feature in the MS Excel. You can still edit text, recolor shape, and apply quick style in MS Excel. Discover why Edraw is the best software to create flowchart. Try Mac Flowchart Software FREE.